Penetration resistance midsole up to 1100 Newton, Anti-Static and Oil Resistant. Himalayan Ladies Star Boot complies with European protective footwear standards EN 20345:2011 and S1P rating. Safety protection tested to 200 Joules impact toecap protection. Ergonomically designed and flexible, made using Full-grain Leather. Up to 200? heat resistant outsole. PU/PU Sole and SRC - Slip Resistance Outsole provides protection and balance, stability and more durability. Ladies' stylish safety boot crafted in a black leather upper with slick pink lines, leather overlays and dual fuchsia stitching details. 300ºC heat resistant rubber sole with front toe bumper. Engineered channels and a central groove on the outsole drains away fluids offering superb slip resistance. V12 Smash Unisex Safety Boot is a top class safety boot tough enough for any job. Sportflex highly flexible rubber sole with Phylon shock absorbing layer for extra comfort. It includes a composite toe cap, steel midsole, heat resistantand is antistatic. 200 Joules steel toe cap and Non-metallic anti-penetration midsole. Slip Resistance : On ceramic surface with 'soap' and on steel with glycerol. Moisture wicking breathable mesh lining. Antistatic & Energy absorbing seat region. Amblers Safety AS104 Ryton Safety Boot conforms to Safety Standards: EN ISO 20345:2011, SRC, S3. A premium boot that combines safety, comfort and style: steel toe cap and midsole, wide fitting and a modern look. A steel mid-sole & toecap, padded collar and shock absorbent sole give the wearer extra protection. And of course the choice of material and the experience of Blackrock-guaranteed endurance and a very keen price. Heavy duty outsole: exceptional abrasion resistance and ideal for environments where oils and solvents are used. 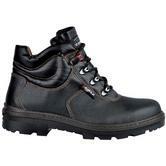 Blackrock SF04 Unisex Safety Boots conforms to CE EN20345 SB-P SRA. The Cofra Reno safety chukka boot has a water repellent leather upper and a breathable lining. It includes an antistatic footbed, a Polyurethane PU Flex sole, a steel toecap and steel mid-sole, and a scuff cap. The Cofra Reno is a lightweight, generous fitting black safety boot. It is Italian designed and made, and conforms to EN ISO 20345 S3 safety standards. Made of high quality natural leather with a built-up heel that stabilizes the ankle. Reflective tape is placed around the upper to improve the user's safety in poor visibility conditions. 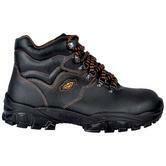 Black, water-resistant leather safety boot with dual density anti-slip polyurethane sole. Padded Techno Dry footbed for comfort. 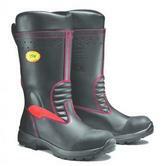 U-Power Pitucon Unisex S3 SRC Safety Boot conforms to: EN20345 S3 SRC standards. V12 Elk features speed lacing, bellow tongues and padded collar. Triple stitched stress points and bellows tongue. Padded textile Lining, moisture wicking and highly breathable boots - cool in summer, warm in winter. Wide fitting corrosion resistant steel Toe Cap and corrosion resistant Steel Midsole tested to 1100N. Dual density polyurethane sole heat resistant to approximately 150°C. V12 V6471 Elk Unisex Safety Boot conforms to: EN20345:2011 - S1P SRA safey standards. Beeswift Slip-On Antistatic White Safety Chukka Boots are a tough, sturdy boot that is mainly used in the food industry. They are also be used in areas where high hygiene standards are required such as the pharmaceutical industry. Oil resistant sole keeps feet dry and warm. They include a durable steel toe cap, cushioned ankle collar, elasticated gusset under the tongue for a tight snug fit. 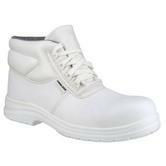 Beeswift Click Beaver Slip-On White Safety Chukka Boot compliant with: EN20345 S2 SRA safety standards. 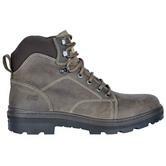 Amblers FS126 Unisex Safety Boots are manufactured from crazy horse leather. Has mid sole protection and hard wearing rubber soles. Fashioned with crazy horse leather upper and comfort fitted padded collar tab. Lace up front with four hard wearing metal D-ring lace holds and two upper speed lacing hooks. Durable rubber sole unit and pull-on heel tab. 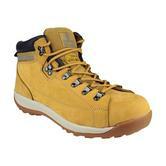 Amblers Waterproof Hiker Safety Boot is made from a robust and durable sole, which is flexible and comfortable. This boot gives you ultimate protection. Designed with extra comfort, is made with a steel toe cap and durable sole, which is flexible and comfortable. This boot gives you ultimate protection. Designed with extra comfort, the outsole is made from a Rubber/ Phylon composite. Cushioned pull loop tongue for comfortable fit every time. Complies with SB-P-W/P-SRC safety standards. Toe protection up to 200 joules of force and a puncture resistant mid sole. Water proof protection for added security. Features a Mir-tex waterproof breathable membrane that keeps your feet fresh and dry. Amblers FS84 are a hard-wearing yet extremely comfortable safety boot. These have an antistatic sole that's heat resistant to 200°c, and repels oil, acids and solvents. Padded ankle collars give extra support, steel toe cap and midsole for protection, and an inner layer of foam for added comfort. Amblers FS987 feature internal metatarsal protection made with Poron XRD. Made with waterproof lining, water resistant leather, and a heat resistant outsole, these boots feature a padded collar. Rubber bump toe, and a heel guard for added protection. The FS122 is an incredibly popular member of the very successful Amblers Steel range of safety footwear. Incorporating a steel midsole this stylish hiker is hardwearing but exceptionally comfortable with rubber/phylon sole. Amblers FS115 tan safety dealer boots are excellent value work boots that include steel toe/steel plate that provides slip resistant and meets high safety standards. The Amblers FS513 white safety boot is super lightweight. 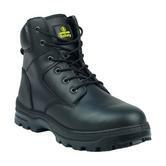 These are great value for such a high safety standards,- certified to EN ISO 20345 norm, with steel toe cap and S2. The amblers FS513 features water-resistant uppers, SRC non slip soles, and an anti-bacterial lining and footbed. Special low thread semismooth outsole - so that it does not pick up/carry dirt. These boots are used widely within the food industry, hygiene and within pharma or tech sectors - where cleanroom, white safety footwear is required. 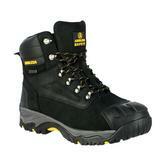 Amblers FS116 dealer safety boots are tough and durable. Incorporates a pull loop on the back heel which makes it easy to pull on for quick fitting if required. Stylish boots made from high quality materials these boots comply with the highest of safety standards Elasticated gusset for extra secure fit every time make these boots an essential for everyday work. It incorporates steel toe cap and steel midsole. The rubber sole is tough and durable. Complies fully with EN ISO2345 and SB-P safety standards. U-Power Track boot has a full grain, water resistant leather upper with 'Wing tex' lining. Wing Tex is a revolutionary Air Tunnel lining - for improved breathability. It has a stress out system in the tongue for extra comfort. It has a Non-metallic toe cap with a penetration-resistant midsole. It also has a breathable lining membrane - to allow your foot to breathe. Action dry footbed - EVA ergonomic support with open cells to keep the foot dryer and antifungal. It has a dual density PU outsole with shock absorbing Airbag cell. 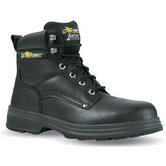 U-Power Track S3 SRC Safety Boot conforms to: EN 20345:2011 S3 SRC. 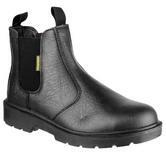 Cofra Land Unisex S3 safety boot: Made using Italian leather, these boots are water repellent, abrasion resistant, and breathable. The Land is a lightweight, roomy comfortable safety boot, with antistatic, steel midsole and steel toe cap protection. The antistatic 'AIR' footbed provides excellent stability, while the steel toe cap and zero perforation, non metallic midsole give it strength. Textile breathable llining it absorbs and releases moisture, and is abrasion resistant. 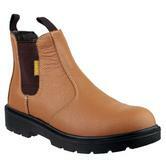 Cofra Paride safety boot includes a water repellent leather upper, a breathable, abrasion resistant lining. Fully removable and antistatic 'POLY-BED' footbed. The lining absorbs and releases moisture for comfort. This boot also includes tough, durable dual density polyurethane sole. Steel toe cap , mid-sole has a non metallic plate. Quick release system CLIP DUCK® for quick fitting on your feet. Conforms to EN345 S3 safety standards. 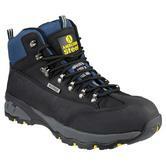 Hi-top safety boot with steel toe cap and midsole protection. Amblers FS008 Hi-Cut Side Zip Safety Boots conforms to EN ISO 20345:2011 safety footwear standards. 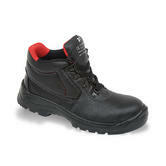 Black leather safety boot: Water Resistant, breathable lining. Amblers FS006C has 6 eyelets, pierce resistant midsole,and composite toe cap (all non-metallic!). The long-lasting dual density polyurethane sole has an energy absorbing heel and is antistatic. Metal-free non-metallic components make the FS006C ideal for police, emergency services, security personnel, military, and special operations. Amblers FS006C Metal-Free S3 Leather Safety Boot conforms to: EN ISO 20345 S3 W/P water resistance & SRC slip resistance. Manufactured with full grain leather specially treated to be water repellent. The ankle area is reinforced providing exceptional ankle protection. With an elasticated upper design these boots are an ideal fit. Durable lining designed to ensure maximum comfort with a breathable materials. Lightweight Aluminium toe cap provides 200 joules of impact protection. The sole used is antistatic nitrile rubber finished with a shock absorbing heel. 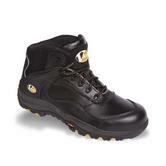 Jolly 9006/GA Fire Gore-Tex Boot conforms to: EN ISO 20345 & EN15090 Safety Standards. 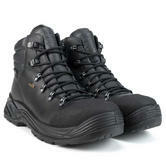 Amblers Safety FS993 Unisex Safety Footwear is a stylish hardwearing S3 protective boot with waterproof leather upper. reflective heel stripe, steel toe and midsole protection, protective toe and heel guard overlays, kick heel panel. Optional low or high leg speed lacing, padded collar and tongue, heel pull-on loop, hardwearing rubber outsole, cushioning phylon midsole. Energy absorbing heel and antistatic construction. The Jolly Boot 840/GA is a beautifully made, Italian designed, Gore-Tex, Waterproof, durable and comfortable safety boot. As the attached tech spec sheet shows, these boots far surpass the EN iso20345 S3 standards! The 840/GA is a premium, WATERPROOF, breathable safety boot. It is ideal for elite Police, Ambulance, Fire Brigade and Council Workers. It gives you great ankle support and stability on all surfaces. It has a steel toecap and midsole. It has a dual density PU outsole for comfort, durability and heel energy absorption. It is Gore-Tex Waterproof and breathable. Goretex performance comfort lining; with excellent cold insulation properties. The sole is resistant to fuel oil and has excellent grip. It has a rapid off-lacing system. Complies to EN ISO 20345 :2004 S3 safety standards. NB If you only want "ladies safety" then put that into the search bar for a tighter selection of ladies-only safety footwear. Please call us on 0044 28 71 286100 / or email us on sales@northseaworkwear.com to guide you with any bulk purchases, or for any other queries on safety trainers for women.